Q: I kind of just want to do that thing that films do, you know where the scene begins mid conversation and you’re right into the action? A: Yeah I know what you mean – Like 'Coffee And Cigarettes'. Q: But where are you right now? Rotterdam right? A: Yeah I’m in Rotterdam, I live close to the water here. Q: Still working at Clone? A: Nah not anymore. I enjoyed it but I’m looking for something a little more intellectually stimulating to do alongside my music stuff. Something to do with my study. Although, I still go there almost every week of course. Q: What was it you studied again? A: I studied urban sociology, like city planning, improving neighbourhoods etc. Especially the interplay between the physical structure of cities and the social element, like the way people interact. That’s something I am interested in. Q: Ah that’s really interesting, I sometimes think about how that affects Amsterdam, I don’t feel like it’s designed in a way where people in the outer areas can integrate much with the people of the centre. It also doesn’t seem able to handle the demands of globalisation too – it can get so hectic. A: Yeah I totally agree. That’s one of the reasons why I moved to Rotterdam. I felt kind of suppressed in Amsterdam, in those busy central streets. It’s not really geared to accommodate a lot of people. The entire centre can be seen as one big 16th century monument, and that creates a challenge structurally. If you compare it to a city like Berlin, there’s way more space there – it’s a little more logically structured, and suited for modern living. Q: Is that similar in Rotterdam too? A: Yeah Rotterdam is spacious too, it has large streets, many empty buildings. I’m also really into architecture. One of those empty buildings is just around the corner from my house. It’s called the HAKA-Gebouw. It’s the abandoned building of the fruit-trading corporation, they imported and distributed fruit from all over the world. I like the shape of it – it’s pretty beautiful to me. Q: Are there also other buildings you like? A: Most people know this one – it’s called the Van Nelle-fabriek. 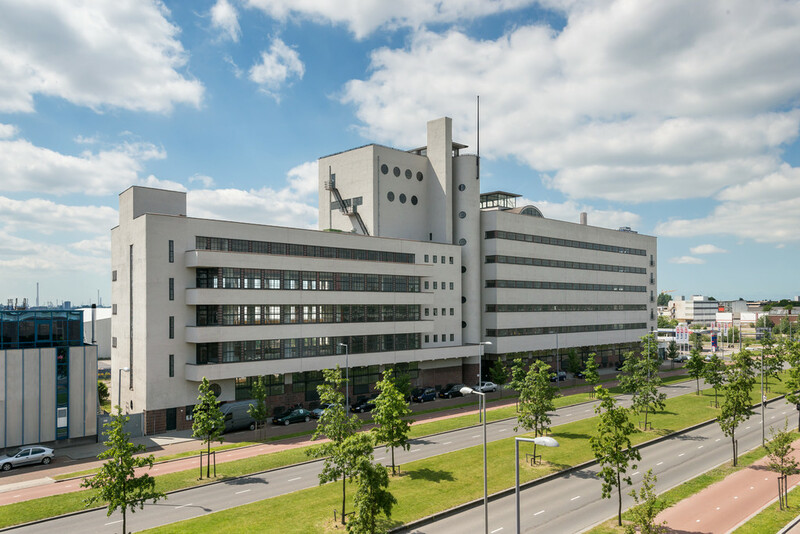 It’s one of the first and most famous modernist buildings in The Netherlands. They produced coffee and tobacco here, it’s from the 1920s/30s. I actually once played at someone’s graduation party there, in an upper floor room with a beautiful view. It was definitely the worst echoey sound, but the best view I ever played with. Q: I’m enjoying the way this is heading as a digital tour, what’s coming next? A: This building will be part of the Boijmans van Beuningen Museum, a modern art museum with classical pieces too. They change their selection in the museum often, but here you can see the entire collection on display. They once had a cool exhibition with two pieces in a large room. One side there was a video of two hooligan crews fighting, viewed from above on a high building. On the other side there was a renaissance painting of purgatory. You could sit there in the room without pressure, enjoy and think about them both. I just sent you another picture of a building I like, an old squat from the late 1800s, Sil from Clone used to throw his Midlight parties there a few years ago, it’s just south of the Maas. I have one more, this one is really cool. It’s the Henry Moore sculpture. If you scroll down to the second picture you can see more clearly. On the bottom right there is a brick wall. They actually transported the wall from another building and fit it directly into this new one. I really like this, it’s completely out of place – odd and dissonant..
Q: When it comes to urban sociology where are you getting your ideas from, are you reading much? A: Yeah I like to read books. A good one is ‘Happy City’ – it’s a study on how structural elements of a city can directly affect happiness. Like something as simple as making a staircase more accessible instead of an elevator, you get more human interaction. This is the kind of stuff I’m interested in, ways to develop more inviting public spaces. Q: You seem to have some knowledge stored up on this, I’m surprised you didn’t find a role yet. A: I need to give it a little more effort, but maybe we can turn this interview into an open application for city planning positions? Q: Haha - great idea man! My only concern though, is if we find you a job does this mean there’s a threat to your music career? A: Absolutely not, I just want something on the side to keep myself intellectually stimulated. I still really enjoy DJing, and I’m working on a new more experimental project alongside that which is keeping me engaged. The opportunity to play live was first given to me by Shane Burmania, one of the programmers at Muziekgebouw aan ‘t IJ, he invited me to play live for the first time at the World Minimal Music Festival. He’s a guy with great ideas who doesn’t get enough credit for the work he does. For the concert on Saturday evening I’ll be building on the piece from World Minimal Music Festival. It’s going to be quite special in the middle of the audience under the Warping Halos artwork from Chrildren of the Light. But I am much more nervous for the Monday morning closing Het Muzieklokaal. I already get butterflies in my stomach when I think of tracks I want to play. I’ll be playing both live and DJ next week during ADE at De School. Oceanic's live performance will be in De Aula on Saturday night, along with Iona Fortune and JD Twitch. His closing set will be in Het Muzieklokaal, Sunday night from 05:00 until close.